MOSCOW (Sputnik), Tommy Yang - The revamped North American free trade agreement, known as the United States-Mexico-Canada Agreement (USMCA), could bring hope for progress in US-China trade negotiations after Washington demonstrated its flexibility in reaching the new trade pact with Canada and Mexico, experts told Sputnik. Trade negotiators from the United States and Canada beat the Sunday midnight deadline to resolve their differences for a new free trade agreement to be signed by the three nations in North America, including Mexico, by late November. The new trade pact will replace the 24-year-old North America Free Trade Agreement (NAFTA) and is expected to cover a region that trades more than $1 trillion annually. US President Donald Trump has called NAFTA the "single worst trade deal" in US history and vowed to renegotiate a better deal for the United States since taking office early last year. 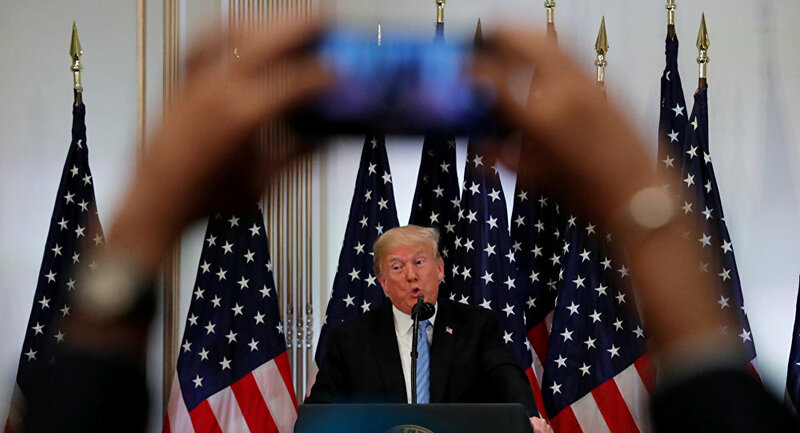 After the three countries reached a new trade agreement, Trump highlighted the new deal’s benefits for the United States on Monday. "It is a great deal for all three countries, solves the many deficiencies and mistakes in NAFTA, greatly opens markets to our Farmers and Manufacturers, reduces Trade Barriers to the United States and will bring all three Great Nations together in competition with the rest of the world. The USMCA is a historic transaction!" Trump wrote in messages posted on his official Twitter account. From his hawkish rhetoric in the beginning to making concessions to reach a trade agreement, the evolution of Trump’s position during negotiations of the USMCA has demonstrated that the US president could be more flexible in trade talks, which could be a sign of hope for progress in trade negotiations between the United States and China, Chinese economists suggested. "This [the USMCA] shows the United States is willing to reach a trade agreement. I think China can see hope from this. We can see the willingness from the United States to work toward an agreement. We also saw the flexibility from the US side, as it made some concessions to its allies such as Canada. A successful negotiation relies on [both sides] making concessions," Cheng Dawei, a professor of economics at Renmin University in Beijing, who specializes in international commercial diplomacy and WTO related studies, told Sputnik. For example, Chapter 19, a trade dispute settlement mechanism Canada fought hard to save, remained intact under the new USMCA, despite the Trump administration’s initial attempts to eliminate it. The economist expressed optimism about China and the United States reaching an agreement when both sides can return to the negotiation table in the future. However, US economists warned that it will be difficult for the United States to force China to agree to its terms like it did with Japan in the 1980s. "The US position is very clear. It’s a big imperial power. They think they have the power to order everyone around and tell them what to do. That’s exactly what they did with Japan in the early 1980s. That’s what they’re trying to do now. I think the stumbling bar will be China, because China is also a big power. I don’t think China would be easy to roll over as Japan did," Steve Hanke, a professor of applied economics at Johns Hopkins University in Baltimore, Maryland, told Sputnik. Trade tensions between the United States and China continued to escalate in recent months, as both countries introduced steep reciprocal tariffs on each other. Despite Trump’s claim of victory for the United States under the USMCA, the new trade pact is unlikely to be effective because it goes against basic free trade principles, professor Hanke argued. "All these so-called deals, the main thing to remember is that they’re government-mandated trade. They have nothing to do with free trade at all. They mandate the number of cars will be allowed to come to the United States. They have terrible local content rules that the products being sent to the United States have to be assembled or produced either in Canada, Mexico or the United States. It’s central planning ‘gone mad,’" he said. The US economist pointed out that the problem with Trump’s position is that he believes the massive US trade deficit is caused by trade policies and practices of its trade partners. "He [Trump] has the wrong idea about the trade balance. He doesn’t understand that the trade balance has nothing to do with the so-called unfair trade practices by China or anybody else. It’s strictly made in the United States. The trade balance is determined by deficiency in US savings," he said. The expert explained where the US trade deficit originated from. "None of this [trade agreements] will change the balance of trade of the United States. The balance of trade is determined by activities, such as savings and investments, in the United States. Savings is much less than the investments because of the government deficit. That’s what determines the US trade deficit. It’s really the government finance deficit in the United States. The US fiscal deficit is going to get bigger under Trump. That means the trade deficit is going to get bigger," he said. The economist further explained that a country’s trade deficit is just the mirror image of what is happening in the US domestic economy, where expenditures exceed the incomes produced, leading to the excess expenditures to be met by an excess of imports over exports, which causes a trade deficit. The Baltimore-based economist argued that the massive annual US trade deficit is not a problem for the country’s economy. "As long as Trump is president, he will claim that trade deficit is a bad thing. It’s created because foreigners who are manipulating their currencies and engage in unfair trade practices. But the trade deficit is not a problem for the United States, as long as the country can borrow money cheaply to finance it. We’ve had it every year since 1975. That hasn’t caused a problem," professor Hanke said. The expert explained that the US dollar’s position as the world’s reserve currency has allowed the United States to borrow at attractive rates to finance its trade deficit. He believes the US dollar is expected to hold onto this privilege in the global financial system in the foreseeable future. "With currencies, there is always one King, and it’s hard to knock the King off his throne. That’s why the average life of a King over the last 2,500 years has been 300 years," he said. Nevertheless, the economist expects US politicians to continue to exploit the trade deficit for political purposes. "In economic terms, the trade deficit is not an issue. Politically, it’s a big deal if you have politicians who tell everybody that the trade deficit is bad. Almost no politician in Washington DC, no matter what their political party is, understands this. Many of them think the trade deficit is a bad thing. And many think the trade deficit is caused by foreigners," he said. As a result, the expert believes future US presidents after Trump could continue the current confrontational trade policies against China.